If you are like the majority of individuals living and working in today’s society, you probably spend a good portion of your day sitting. You go from sitting at the breakfast table, to your desk at work, then driving from point A to point Z and back again, followed by finishing your day relaxing in the recliner. Ironically, even though our lives tend to be fast-paced, we seem to spend a significant amount of our day sitting. So many of our patients at Hampton Physical Therapy arrive with complaints of pain that are often contributed to the effects of prolonged and frequent sitting. One of the first questions posed to our patients is “What do you do for a living?” and the response often follows as such, “I spend the majority of my work day at a desk, on a computer,” or “My commute is 45 minutes one way,” or “Well, I’m retired now, and spend a lot of my day reading, and watching television.” No matter your age, profession, or level of fitness, we cannot deny that most of us spend too much time sitting, and unfortunately, we are all subject to the adverse effects prolonged sitting can wreak on our bodies. Although we attempt to be conscious of our posture, inevitably as time progresses and we become busier, we begin to fall into poor sitting posture. If someone were to snap a photograph of you after sitting for as little as ten minutes, most of us would demonstrate a slouched, curved spine, with a forward head and rounded shoulders. 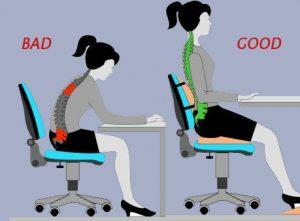 Looking something like the picture below showing both poor and good sitting posture. So what does this mean for you and your body? Let us begin at the top and work our way down the spine. As your posture begins to decline, it places your shoulders in a rounded position and your head/neck forward. This, in turn, can cause tightness of the shoulder and neck muscles which can often lead to headaches, neck pain, shoulder pain, and paresthesia (numbness or tingling) into your upper extremities. As you sit, your lumbar spine (low back) loses its normal curvature, placing your pelvis into a posterior pelvic tilt, and placing more pressure on your sacrum (tailbone), and the discs in between your vertebrae. Research shows that after only 1-2 hours of sitting, lumbar (low back) stiffness increases, therefore placing you at a higher risk for low back injury and pain. Prolonged sitting can also increase your chances of developing problems such as: sciatica, numbness/tingling/pain that radiates into the leg, and hip pain…just to name a few! So what can you do to prevent the adverse effects of prolonged and frequent sitting? Well, one of the best things is to limit how often and how long you sit. Obviously, you cannot change the fact that you must sit at work, or drive the kids to and from their sporting events, but you can try to monitor how long you are sitting. Set a timer on your watch or cell phone that reminds you to stand or walk around every 30-45 minutes. The act of standing can decrease the pressure placed on the spine and allow your spine to return to its proper alignment. Simple stretches and exercises can also decrease the effects of sitting. For example, performing shoulders rolls (forward and backward), neck range of motion (looking up & down, left & right), and scapular retraction (pulling shoulder blades together) every 1-2 hours can increase blood flow, decrease stiffness and tightness of muscles and joints. 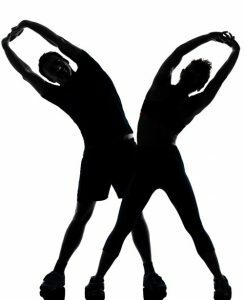 For the low back and hips, you can stand and perform back bends (arching your spine backward), legs swings (kicking leg forward & back, then side-to-side 10x/leg), and a piriformis stretch (seen below, hold the stretch for 30 seconds, repeat 3x/leg). Finally, proper sitting posture is critical. It is important to sit with head in a neutral position, looking straight ahead, shoulders down and back, support in curve of low back, thighs parallel to floor, and feet flat on the ground. These are just a few simple recommendations, but if you feel your pain or symptoms need to be addressed by a healthcare provider, please feel free to call and speak to one of our physical therapists. We would be more than happy to answer any questions you may have. Hampton Physical Therapy has clinics in both Hampton & Seabrook, NH.